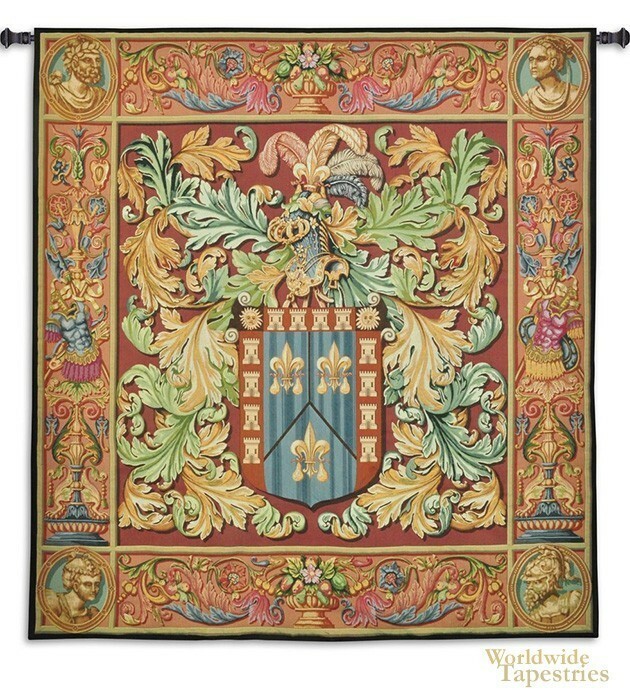 Regal Crest tapestry shows a gorgeous French coat of arms in beautiful colors. The royal crest of family crest was a coat of arms used by families over centuries of European culture to signify family lines. These tapestries were passed from generation to generation and were also spoils of war, collected by the victors as valuable art items. Here we see a most wonderful royal crest in colors of burnt orange and red backgrounds, with greens, blue-greens, golds, blues and pinks to produce a work of immense beauty. The design itself is beautiful with the central shield and fluer de lis emblems, the leaf motifs, and the surrounding elements of urns, famous figures, and body armor surrounding the work. This is a stunning work showing a French royal crest full of traditional symbolism. This Next Village tapestry is backed with lining and tunnel for easy hanging. Note: tapestry rod and tassels, where pictured, are purchased separately. Dimensions: W 63" x H 73"